Brewers Todd Baldwin, Michael Acerra, and Jeff Lockhart in the newly opened Red Leg Brewing Co tap room. 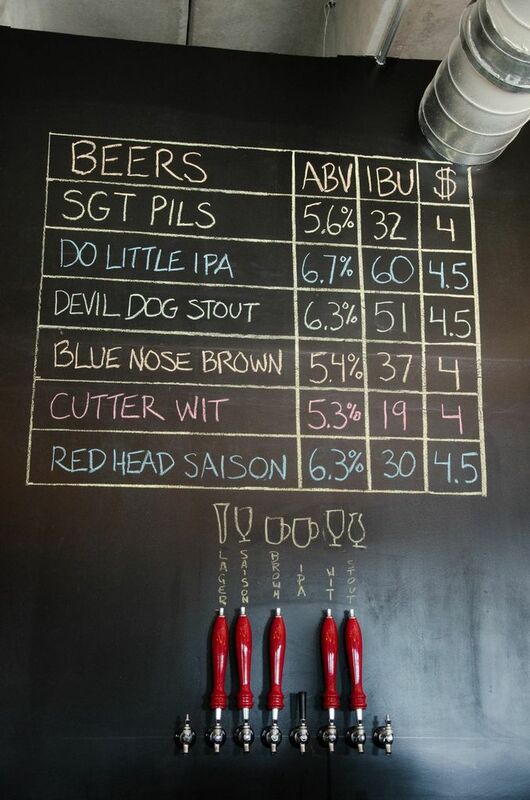 These words were on the chalkboard last weekend when Red Leg Brewing Company opened their doors with a bang, and with a solid lineup of beers, during the fitting July 4th holiday. This brewery has big plans. Big 15 barrel plans, but it is going to take some time. As it is a familiar story with several new breweries and expanding breweries, Red Leg is still waiting on the 15 barrel system for another couple of months. They are expecting, and hoping, to be brewing on the system in September so they can begin distribution soon thereafter. 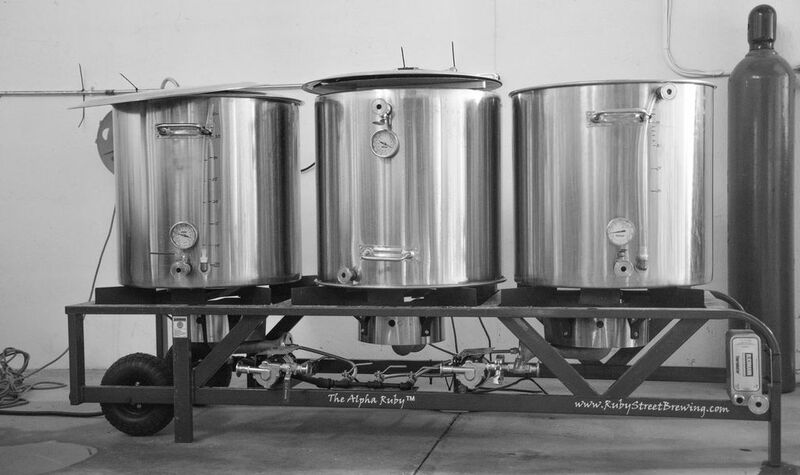 It puts them a little behind schedule, but with their smaller pilot system they’re still able to crank out some brews. Two of their brewers have already picked up a small canning line. They bought the two-filler set up from Great Crescent Brewing in Indiana on what sounds like an adventure of a trek to bring it to their spacious brewery off of Forge Road, near Garden of the Gods Road. Until the anticipated system arrives, they will continue to keep up with demand on their one barrel pilot system. This philosophy, and the beer, has been a hit. Their very first weekend open Red Leg Brewing Company’s tap room was packed. There were even whispers of (gasp!) running out of beer (another commonality with new breweries). Red Leg has jumped right in to the midst of the “Bermuda Triangle of Breweries” in the neighborhood. They already have regular customers, and I heard murmurs of people claiming it their new neighborhood hangout. Sitting at the bar I saw several veterans come up and instantly have a connection with the brewers. These customers obviously felt at home and quickly shared stories. On Saturday afternoon, a group of cyclists were sitting in the corner that had just finished the Ride-to-Recovery in Denver. They had each gotten the flight to try all of the new breweries beers and were very excited to have a spot in town that was supporting those who have served. Not having any military ties, I didn’t feel like an outsider.When it comes down to it, Red Leg is a brewery that makes great beer. My favorite: Devil Dog Stout. This beer was a nicely balanced stout with roasty, coffee, and rye notes. The most talked about beer was Redhead Saison. This ironically named ginger and pepper beer received a lot of praise. The rest of the beers were solid as well, so Red Leg left a good impression on all. 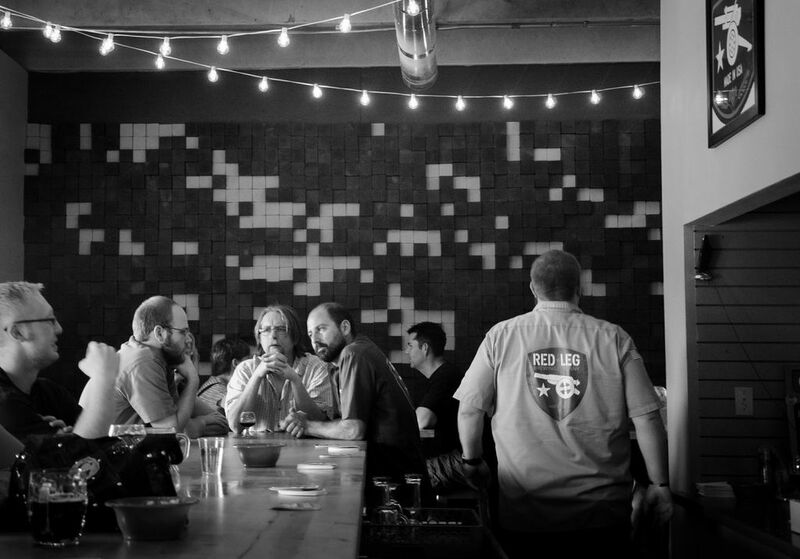 Thanks to such a popular response to their opening, Red Leg will be doubling their tasting room hours just two weeks in to their operations. Starting July 18th, they will be open Thursday through Sunday, Noon-8pm. If you are looking to check them out this weekend, they will be open Friday and Saturday, Noon-8pm. It is always welcoming to see new breweries in the Pikes Peak Region, and encouraging to see them do so well.